There are 22 Assisted Living Facilities in the Natick area, with 2 in Natick and 20 nearby. To help you with your search, browse the 127 reviews below for assisted living facilities in Natick. On average, consumers rate assisted living in Natick 4.4 out of 5 stars. Better rated regions include Wayland with an average rating of 4.4 out of 5 stars. Caring.com has helped thousands of families find high-quality senior care. To speak with one of our Family Advisors about assisted living options and costs in Natick, call (855) 863-8283. Natick was first founded in 1652 by Puritan missionary John Eliot who is responsible for the first bible printed in America, the “Eliot Bible.” In addition to this area’s centuried history, seniors are within close proximity to the Boston area and have two Assisted Living Facilities (ALFs) to choose from in town and another 57 in nearby. The state of Massachusetts refer to ALFs as Assisted Living Residences (ALRs), and they are regulated by the Executive Office of Elder Affairs. ALRs support senior residents by offering supervision and assistance such as personal care needs and basic medical care from trained staff. Seniors who like to be active all year round may have difficulty in Natick, due to the climate. The summers are warm and pleasant, with an average high temperature of 83 degrees, but the winters are chilly with an average low temperature of 16 degrees. With 46 inches of annual snowfall, seniors with limited mobility may have trouble getting around in the winter months. Seniors and their loved ones can feel quite safe in Natick, due to the low crime rate. Violent crime is rated at 13.2 out of 100 (1 being the safest), which is much lower than the national average of 31.1. Property crime is rated at 32.7, which is lower than the national average of 38.1. Natick has the Massachusetts Bay Transportation Authority Commuter Rail (MBTA) that offers transportation to shopping, doctor’s appointments and local attractions. Seniors can receive a reduced fare for this service. Seniors living with a respiratory condition may fare better in Middlesex County than in many other parts of the country. The American Lung Association gave this area a solid B rating for air quality. The Natick area is home to world-class medical facilities, including MetroWest Medical Center, in the event of medical emergencies or illness. Seniors in Natick may enjoy spending their time at the local Sassamon Trace Golf Course for a few rounds, taking a trip into nearby Boston to see a Red Sox game at Fenway Park or exploring the Boston Museum of Fine Arts. Assisted Living costs in Natick start around $0 per month on average, while the nationwide average cost of assisted living is $4,000 per month, according to the latest figures from Genworth’s Cost of Care Survey. It’s important to note that assisted living rates in Natick and the surrounding suburbs can vary widely based on factors such as location, the level of care needed, apartment size and the types of amenities offered at each community. 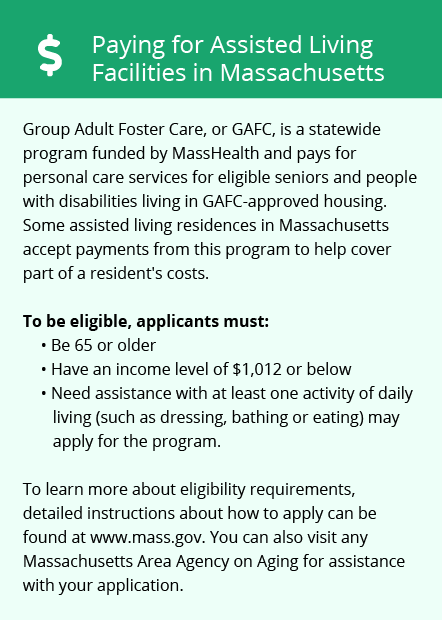 Medicaid recipients in Massachusetts may be able to receive funding to cover assisted living costs. 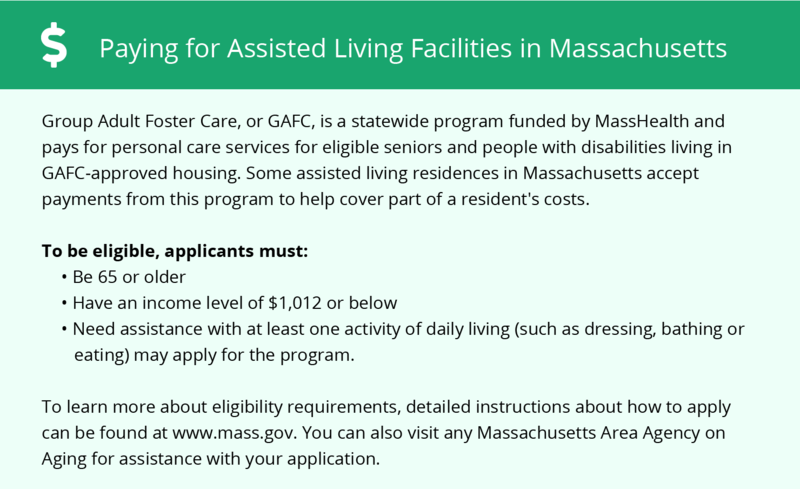 Massachusetts also offers the non-medical Supportive Senior Housing Initiative which could assist some qualified seniors who do not have Medicaid. Natick and the surrounding area are home to numerous government agencies and non-profit organizations offering help for seniors searching for or currently residing in an assisted living community. These organizations can also provide assistance in a number of other eldercare services such as geriatric care management, elder law advice, estate planning, finding home care and health and wellness programs. To see a list of free assisted living resources in Natick, please visit our Assisted Living in Massachusetts page. Natick-area assisted living communities must adhere to the comprehensive set of state laws and regulations that all assisted living communities in Massachusetts are required to follow. Visit our Assisted Living in Massachusetts page for more information about these laws.